Joel and Carrie stop kissing when they notice Dee, who runs off. Joel and Carrie get out of the pool and they both call after her. They chase her through the house watched by an amused Toadie, still calling out to her. Outside, Tess and Daniel are unloading a chair from his car, and Tess is telling him what a causal fun neighbourhood it is, as Dee and Joel come racing out. Dee says she doesn't want to hear it as Joel and Carrie try to talk to her and Toadie, Tess and Daniel all watch. ‘Relaxed, casual and fun?' asks Daniel. ‘Well, most of the time' says Tess. In the house, Tess tells Daniel about all the happenings in the street, the Scullys fire, Karl and Joe's fighting, the fact that Harold wants to know everything that's goiing on, Lance's dramas with Amy and Steph's occasional ‘crashing' at their place after a night out. He says it's a busy place. Steph says sometimes it's so quiet and peaceful you wouldn't think there was a thing wrong in the world. Harold is sounding off to Lou about Don Mcready's latest business decision to have the staff of Grease Monkey's on roller skates, which he's not keen on and Lou is enjoying the thought of Harold on rollerskates. Lance is telling Anne that ‘at the risk of sounding like a total squid' he's going to miss her. Toadie comes in and asks Anne when she's having goodbye drinks. Anne doesn't want to, preferring to just go round the street and say goodbye to everyone. Toadie tells her to avoid NO 30, which is ‘like World War 3 at the moment'. Lance works out that Joel's been ‘caught double-dipping'. Anne doesn't understand what's going on, Toadie tells her not to worry about it but ‘Joely-Woely's done a bad bad thing'. Joel and Carrie agree that Dee has every right to be angry. Carrie feels it's the end of their friendship and also whatever she and Joel had. Joel apologises as Carrie leaves and Joel looks thoughtful as he slumps against the door. Tess and Daniel finish unpacking and reflect that nothing matches. He says he has something in the car that will really blow Tess' mind and goes to get it. Anne comes in and Tess asks her how she feels about leaving. She's pretty mixed up. Excited about seeing Bily, sad about leaving and has loads ot thoughts going round in her head. Tess says she's been a really good friend. Daniel comes back in with a picture that he's very proud of but means nothing to the girls. Lou needs milk for a new cocktail that's fashionable. 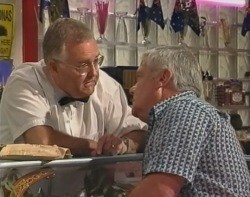 Harold tells him that Merridy was in earlier and they got on very well, finding out they have stuff in common. Lou wants to know the details and Harold winds him up, saying he's obviously very keen on Merridy, wanting to know every little thing about her, and suggests Lou ask her out. Lou leaves, slightly embarrassed, which makes Harold laugh. Joel looks sad sat at the table. Toadie and Joel come in and calls from the hallway ‘helllooooo, are you dead?' they have some bottles with them and crack some jokes at his expense. JOEL: I've just lost the best girl I ever had. They encourage him to go with them to get Anne to have a few goodbye drinks. He goes reluctantly. Daniel has replaced one of Tess' painting's with his, and she's clearly being polite about it. Anne comes in with her completed packing and the NO 30 boys come in with champagne. They tell Anne she has to have goodbye drinks, and they all settle down. Anne says she heard about ‘Joel's trouble'. He's getting a bit irritated with Toadie's jokes. Lance and Anne try to get Toadie to be a bit more sympathetic and Joel leaves to get nibblies. Dee runs into both Joel and Carrie outside, who are full of apologies and how stupid they were. When she discovers it wasn't the first time they kissed, she goes inside and Joel follows, asking Carrie to stay outside. Inside, he asks for one minute to talk to her and then he'll leave her alone. He says that he isn't sleazy, he wasn't using her and he's sorry. Dee says that somewhere inside he's a good person, but he should grow up or he'll never know how speccial a relationship can be. Lou and Harold have joined the party. Lance pulls Anne aside and gives her a present of a photo of both of them in really daggy 80's dress. She gives him it back and races off to get something else while Joel comes in the front door. Toadie apologises for cracking jokes earlier, and Joel says it's ok. Anne comes back out with the exact same photo in a different frame for Lance as a gift. Lance tells her to call ‘telepathically' if she needs him ‘but not while I'm sleeping or you'll wreck my dreams' and they hug. They rejoin the room and Toadie makes a toast to ‘one of my best buds of all time'. Later after the party, Daniel goes to answer the phone, but Tess stops him in a panic. It's Bill. Tess says he's missed Anne and he'll pass the message on to call when she sees her. It's obvious Bill is worried, but Tess says she's not covering for her. When she puts the call down, Daniel wonders what's going on. Tess says she's worried that Brendan won't like her having another guy in the house and she'd prefer it if he didn't answer the phone. Bill finishes some work and sits thoughtfully. Greg asks him if he's looking for inspiration, and Bill says it's something like that. They go off for a coffee. Anne gets on a train and sits down. We see her a couple of times in this scene. Bill tells Greg that he's worried something's going on with Anne. He hasn't heard from her in days and he's missing her. Greg tells him to ‘take it easy, she's a woman, she could be doing anything' Greg tells him to pick up some cedar he's got coming in on the train. On his way to the station, he stops to help a lady called Aggie fix her tyre. The train pulls in at the station, and Anne gets off. She looks around, but can't see anyone. She calls Greg and tells him there's no sign of him. Bill arrives at the station and discovers there's no cedar. He sees Anne and calls after her. He runs up to her and picks her up and kisses her. BILL: I can't believe this is happening, I've missed you so much. How long are you staying? For long? ANNE: Oh what, are you disappointed? ANNE: Dawber - I start next week. BILL: I haven't stopped thinking about you, not for a second. ANNE: …more than anything in this world.